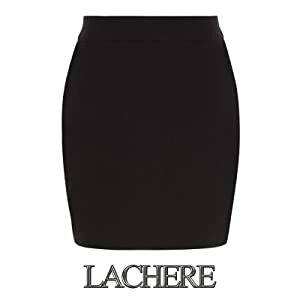 The ultimate stretchy black pencil skirt will serve all your purposes, everything from casual outfits to smart looking ones, whenever you need it. This is the must have of every single stylish gal. If you're looking for a chic and trendy skirt that's versatile enough to create different looks for a variety of occasions, this will be it. UK 4 - XXS - Waist: 22" Hips: 32" Length: 16"
UK 6 - XS - Waist: 24" Hips: 32" Length: 17"
UK 8 - S - Waist: 26" Hips: 34" Length: 17"
UK 10 - M - Waist: 28" Hips: 36" Length: 18"
UK 12 - L- Waist: 30" Hips: 38" Length: 18"
UK 14 - XL- Waist: 32" Hips: 40" Length: 19"
NOTE: Please consider that the model is 5'9"
The skirt might look longer on you if you are shorter than 5'9"
The skirt might look shorter on you if you are taller than 5'9"
Your must-have for all seasons. High waist elastic band accentuates the waistline and enhances the natural figure. Elastane has been added to the fabric to provide optimal range of movement and comfort. Fabric thickness and weight increase the useful life of the skirt and makes it optimal for everyday use.